Welcome to Sole Food, a new review segment on finding the best shoes for your dance needs. While many belly dancers love performing in bare feet, the harsh reality is that the performance spaces we utilize (restaurants, Ren fair stages, hookah bars) are often equipped with the floor equivalent of war zones, from still-smoking hookah coals to broken wine glass bits to mud. Depending on your dance style, costuming, and venue, you need to find the right shoe for the job. Like any costume element, make sure to practice in your shoes before hitting the stage. Without further ado, here is the first shoe review! What is it? A half-sole (or lyrical) shoe protects the ball of the foot and allows for an improved turning surface while leaving the toes and heel uncovered. What’s it made of? Leather, suede and elastic. 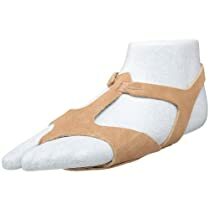 When purchasing dance shoes, always try to go with synthetic materials, as they will breathe when you sweat and will better adjust to your foot shape and size than synthetic materials. What kind of dancers will wear it? Anyone! These are especially great for practice as they can be slipped on and off. These shoes are a little earthier looking, so they may not coordinate as well with high-glitz cabaret-style costumes. What kind of surfaces can I dance on with it? Excellent for hard, smooth, clean surfaces. Do keep in mind that your toes and heels are uncovered and exposed to whatever may be on your dance space’s floor. Not recommended for grass, turf or textured surfaces (blacktop, etc), as the suede and leather on the bottom of the shoe will get damaged. Who makes it? All the standard dance brands including Bloch, Capezio, Leo’s, etc. Different brands have slightly different widths and styling. Sizing tips? Half-sole shoes often run smaller than street shoes. Make sure to consult the manufacturer’s sizing chart, or try on a pair before purchasing.